(Bloomberg) -- Electronic Arts Inc. is leading an index of video-game publishers to the highest in more than two months as new data Thursday suggests digital game spending worldwide has grown. Gamers spent $8.2 billion on digital titles across console, personal computer and mobile devices in February, a 2 percent increase year-over-year, according to statistics from Nielsen’s SuperData Research. 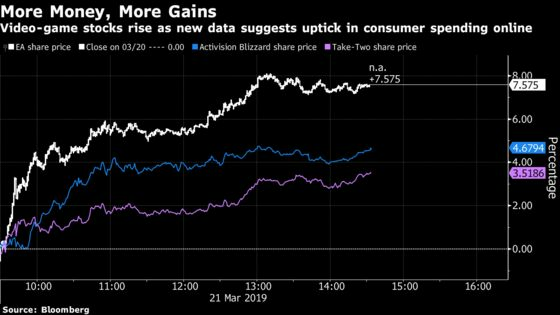 EA climbed as much as 8.1 percent to its highest in a month, Activision Blizzard Inc. rose as much as 4.8 percent and Take-Two Interactive Software Inc. gained 3.5 percent. The uptick in spending coincides with the rising amount of dollars being poured into the industry as competition among publishers increases and tech giants want more of gamers’ free time. “The whole industry is changing right now with streaming increasingly becoming on everyone’s mind,” Nick Licouris, an investment adviser covering video games at Gerber Kawasaki Inc., said in a message. In fact, Google’s forthcoming streaming service Stadia is even seen on Wall Street as a direct benefactor for game publishers. "It’s in the game" is a well-known slogan trotted by EA, and surely its Apex Legends product has put the publisher at the forefront of the industry. The new Nielsen data unveil that Apex Legends has had the best launch month of any free-to-play game in history -- having generated some $92 million last month from in-game spending. EA is poised to sustain this growth should they keep releasing content, as the February data doesn’t include revenue from battle passes introduced this month. "When they talked on the conference call last quarter, EA didn’t put any Apex revenue on their estimates," Licouris said. And with the introduction of a $9.50 price point for battle passes, Apex Legends is "potentially a huge revenue source that wasn’t baked into the numbers already." Apex Legends can quickly become highly accretive to EA’s EPS but probably more so in fiscal 2020, but management and consensus are probably conservatively -- and appropriately -- modeling in little in the way of revenue from the game. Apex Legends may add 78 cents to annualized EPS vs. the median consensus $4.18 for fiscal 2020. While the growth of Apex Legends has been phenomenal, Tim Sweeney, the chief executive officer of Epic Games Inc., said its game Fortnite has "gained an Apex Legends worth" of new users since EA’s product released. Fortnite has recently amassed at least 50 million new gamers -- the amount of Apex Legends’ base -- boasting more than 250 million users to date.